St Valentine’s Day is a day that’s associated to love. In Indian Cinema, not many films are made without a romantic story attached to the overall narrative in some way, if not being totally focused on it. There have been love stories that have touched hearts throughout the 100+ years that Bollywood has existed and there will continue to be. On this day, however, BizAsia is putting a slight twist on the classic love stories that have graced our screens over the last few decades. We’ve picked just a handful and replaced the original cast with contemporary actors from today’s generation which we think would do the film’s absolute justice today. One of the most loved and popular romantic films of its time, Aamir Khan and Madhuri Dixit starrer ‘Dil’ (1990) told the story of Raja and Madhu who fell in love after being rivals at college. Soon they discover that their families are each other’s enemies and they have to secretly meet to continue their affair. We think that the only two actors that would fit into these roles would be Shahid Kapoor and Parineeti Chopra. Both haven’t yet shared the screen and so we think it’d be great to see them together. With Kapoor’s baby face and Chopra’s innocence, we think they would definitely be the ideal cast for the film. Aamir Khan came together with Juhi Chawla in 1988’s ‘Qayamat Se Qayamat Tak’ and it was pure magic on screen. The story was a little far-fetched and unconventional, with their characters becoming lost in a forest and finding love in each other whilst trying to find an escape. The story also concludes with them both dying pretty much together to the dismay and horror of their families. The two actors we feel would fit into these roles are Ayushmann Khurrana and Shraddha Kapoor. Khurrana would be a completely different take on Khan’s character, perhaps being that little bit more mature looking than a baby-faced Aamir Khan. Kapoor would also quite easily fit into Chawla’s character too. Can you see it? Sanjay Leela Bhansali’s ‘Hum Dil De Chuke Sanam’ was a love story with its fair share of heartbreak. In true Bhansali style, he made his main three actors – Salman Khan, Aishwarya Rai Bachchan and Ajay Devgn – give their best performance whilst always maintaining an authenticity as well as making each scene look beautiful. It would difficult to remake the film but if it was to be given a modern-day version, we think Ranveer Singh could step into Khan’s character, Deepika Padukone would essay Rai Bachchan’s role and Arjun Kapoor would be the Ajay Devgn of the film. We think all three would fit in perfectly with the three well-defined roles. The replica scenes between Khan-Devgn would also be absolutely a treat to see Singh-Kapoor performing, as would it be seeing Padukone dance to Nimbooda! Hrithik Roshan and Ameesha Patel saw their debut with 2000’s ‘Kaho Naa Pyaar Hai’ and the film was a runaway success with the audiences. With Roshan being in a double role and Patel playing his love interest twice over, it was a film where the soundtrack was equally as popular as the film and the actors. In our contemporary take, it would star Sidharth Malhotra and Alia Bhatt who we reckon would be the ideal to fit into the roles. They have shown their chemistry already in their debut film together and no doubt this story would give a new dimension to their on-screen presence. If there is an ultimate Valentine’s Day movie complete with specific mention in the plot, then it’s got to be ‘Dil To Pagal Hai’. 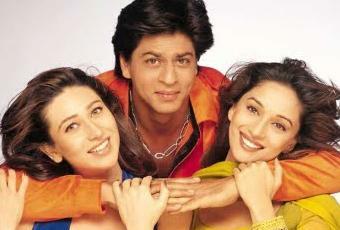 With Shah Rukh Khan, Madhuri Dixit and Karisma Kapoor in the main roles, the dance musical was primarily centred on the idea of soulmates. Yash Chopra’s directorial always proves to be award-winning and there are some truly special scenes throughout the entire film. We think that the actors that could possibly essay the roles in a modern remake would be Varun Dhawan, Kriti Sanon and Shraddha Kapoor as Khan, Kapoor and Dixit respectively. Dhawan’s on-screen magic with both Shraddha and Kriti has been seen previously and been loved. Why wouldn’t it work in this love triangle? If Akshay Kumar’s character was also cast then maybe it’d be good to see perhaps Sushant Singh Rajput in a cameo and maybe he could be paired with Kriti in an additional match-making which wasn’t included in the original? What say? BizAsia would like to take this opportunity to wish all those celebrating a very Happy Valentine’s Day.